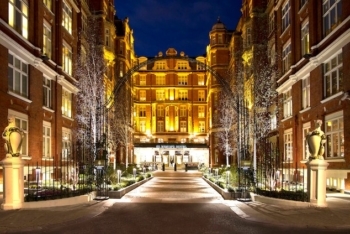 EXCLUSIVE Head for Points Marriott offer! It’s back: EXCLUSIVE Marriott HFP offer – earn 10,000 bonus points for a long weekend in Europe! After a great success of the exclusive offer in September, Marriott has decided to re-run the special promotion exclusively for Head for Points readers! They’ve also added the Four Points in Munich to the promotion. To celebrate the merger of Marriott Rewards and Starwood Preferred Guest into the new (still unnamed!) loyalty programme, Marriott is offering a special points bonus if you book a long weekend in Europe this Autumn. This offer runs in addition to the current Autumn bonus points promotion (article is here and you can register here). This special HFP bonus is on top of your standard points, any elite status bonus AND the 2,000 bonus points you would earn from the ‘MegaBonus In More Places’ offer. Until 30th November 2018, you will get 10,000 bonus points when booking a long weekend stay at select hotels in Amsterdam, Barcelona, Florence, Geneva, London, Milan, Munich, Nice, Paris, Rome, Vienna or Zurich. The special booking page is here. You must book by 30th November and complete your stay by 31st March 2019. We would value 10,000 bonus points at £50+ so this is a generous rebate, especially as you receive all of your standard and promotional points too. You will earn 10,000 bonus points when booking a two night or longer weekend stay – which must include a Thursday night or a Monday night – at select hotels using a promotional code. The promotional code you need to use on the Marriott website is MR6. The rate you get should be the same as the cheapest available generally, eg the Member Prepay and Save rate. You need to book by 30th November for stays until 31st March 2019. You can earn a maximum of 100,000 bonus points from this promotion. More information about this special offer, together with a booking link, is here. PS. Rob stayed at the Marriott Paris Champs Elysees last week in order to take a look at one of the hotels you can book under this offer. He will review it tomorrow. There are already a few pictures on the HFP Instagram feed. I know they recently did a campaign in the summer but wasnt sure if its a regular thing. You will have to wait but historically there has been a promo with Hilton during this period. There will be some new promo from January, could be either double points or another 2000 per stay one. Anyone found some stand out weekend deals to bag the10k. I think this promotion is ruined by the “Thursday night or Monday night” requirement, changing it from a long weekend to half a working week. How can they legitimately exclude a 3 night Friday to Monday stay – surely the very definition of a long weekend? Yes, it’s definitely not weekend offer. I’m flying to Munich and was thinking about booking Marriott after seeing the title. Until I read that Saturday and Sunday night won’t count. Well, Accor it is then (friends staying there). Perhaps it’s to keep the rates up by ensuring one of the nights will be at ‘business day’ rate? Exactly the reasoning I’d say. Hmm.. Currently have a hotel booked in Zagreb for the Christmas weekend. It’s a non-refundable booking that was supposed to be paid in advance (But they haven’t taken the payment yet). Should I cancel and rebook to get the extra 10k points or would I incur a penalty for doing so? More specifically, the cancellation policy says that the time for cancelling without penalty has passed and the forfeiture amount is 100% if I cancel. Would I still be affected even if they haven’t charged me yet? I still have not received any points for any of the 5 stays in September and October despite 5 open support tickets. I am giving up on Marriott until they sort their act out. Agree. I’m still waiting since August for their London offer of stay one night and get 2,000 extra points. I’m also intrigued that I’ve been charged for one night when I was on a stay four nights and get the 5th night free. I’ve hit a wall of silence on something that should be easy to remedy. There seems to be a trend developing of Marriott offers for staying two nights + instead of one night for bonus points. I’d be happy to work from a hotel over extended periods and have done so many times, but seriously they’ve got to get rid of those glass table tops as running a mouse over a menu isn’t productive. Thank you HFP & Thankyou Marriott. I’m guessing none of the participating hotels are at knock-downs prices anytime during the promo ?! Is it really Autumn ??!! More like winter to spring. When will the points from their recent competition start posting ? 8 to 10 weeks in theory.